There have been a number of updates on affordable housing in East Liberty and the East End lately. Please bear with me as I attempt to bring the blog up to speed. The remaining 50% have been indicated as renting at 10-15% below "market rate". Which means looking at rental rates of $800 - $1600 per month, rather than the $1,800 - 3,000 per month rates that are being seen elsewhere in East Liberty's new developments of late. This is good news as these rates will, hopefully, make them accessible to a wider range of residents on more moderate incomes, but who are getting by without subsidy. The coverage also reports that there will be retail spaces that will target leasing to local and minority- and women-owned businesses. This is also good news as we are seeing rates in the commercial district skyrocket. More coverage here via Tim Schooley of the Pittsburgh Business Times. It should also be noted that LG Realty, the owners of Penn Plaza, did also submit for the Mellon's Orchard project and were not awarded. Given the structure of the Memorandum of Understanding from September 2015, the fact that they were not awarded this project currently releases them from obligation to provide affordable housing on the Penn Plaza site. I note "currently" because there may still be tools that the City is developing for all developers on projects of a certain size that can be used to leverage affordable housing in the future (see Affordable Housing Task Recommendations below). Ryan Deto of the City Paper provides updated coverage of the Mellon's Orchard and its relationship to Penn Plaza and Enright Parklet here. The City's Affordable Housing Task Force presented its draft recommendations to City Council on April 28, 2016 at a post-agenda hearing. There was a lot of coverage of the event, including the Post Gazette and others. The Mayor's press release on the recommendations includes a short digestible summary as well. There was also an extremely well attended press conference and hearing right before the post-agenda. Not sure on the actual head count, but many passionate statements on the need for affordable housing. This need is made even clearer via some of the ULI report (see below page 13) that point out that the East End (meaning East Liberty-Larimer-Homewood-East Hills-Lincoln-Lemington) median income is $23,000, meaning that "affordable" (at 30% of income) means a rent of $640 per month. By way of scale, the median for Pittsburgh as a whole is $41,000 with affordable housing clocking in at $1,100. And neither of these rates has been addressed in any new housing that we have seen in East Liberty in the past 4 years. Admittedly, some of the recommendations hit that "well of COURSE!" note, but it is also incredibly important to have these written down, documented, and adopted in order to create a framework that can be used to shape policy. We are looking forward at how the actual implementation of the work moves forward, and how quickly some of it can happen. Housing policy is a massive ship, it is significantly underfunded, and, regardless of how we all know that it is well beyond time to do the right thing, it takes a lot of time, money, and effort to turn it around. Kudos to the City for finally taking it on and accepting the challenges it brings. 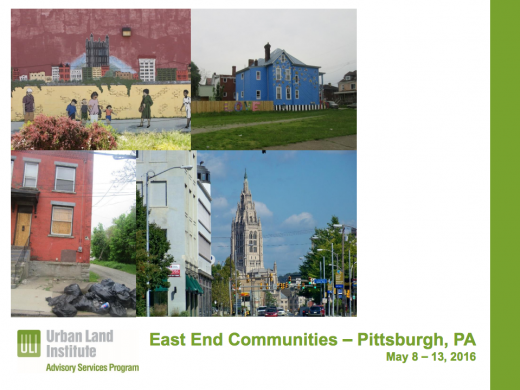 East Liberty Development Inc (ELDI), working in concert with Councilman Burgess's office, contracted with the Urban Land Institute (ULI) to conduct a 5-day visioning exercise to evaluate the vision and strategies for preserving affordable housing in the East End. The goal of this strategy is to preserve and provide a diverse range of high-quality affordable housing; protect existing low-income residents; leverage development and economic growth from public economic and infrastructure investments in East Liberty and Larimer; and to attract new growth from the region. ULI has completed their preliminary report, which you can download here. There is also a link to the powerpoint presentation and Councilman Burgess's office is working to get the televised broadcast of the report out up on-line via the City's cable channel. Stay tuned as more report outs come on-line. You go guys!people from http://moscowmarriageagency.com support you! Affordable housing has become a dream until now. I read from mamaessay that you can provide a solution to that. I am glad to have found this website. Thanks for sharing the update. your content is unique and informative. On the other hand, it is very easy to read. I am very impressed that you are sharing some unique topics here. Cheers! !